Since 1954, FIFA officially start to adjust the size, weight and diameter of the balls. Orange ball Swiss World Champion, manufactured by Kost Sport of Basel, was the first ball, which consisted of 18 panels. Balls with printed on them names and logos used during training and in the matches players to play the same balls without branding. 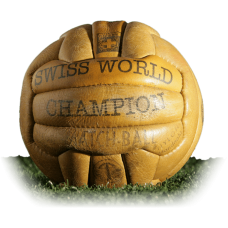 Official ball of the 1958 World Cup in Sweden was chosen as representatives of FIFA. Ball Top Star, ..